BraCuru wrote: To update the topic. 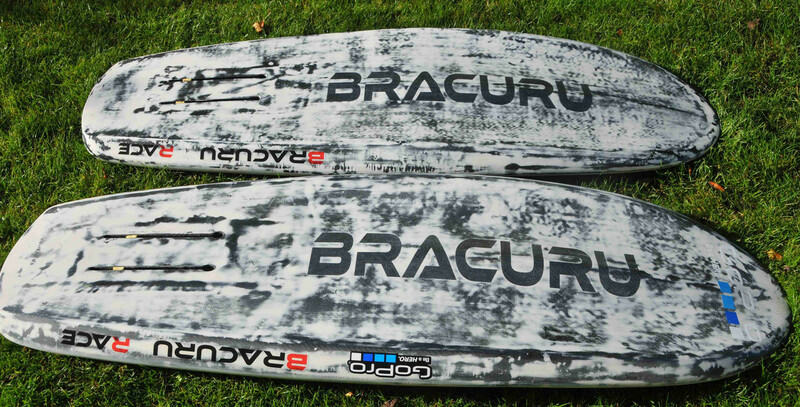 New board design will be tested this month. New shape, new ideas. Wonder to check how does it work. Just an update to my Skillit modifications for The Moses Silente. I ended up dropping in 2 US finboxes. Glad I did as there has been quite a bit of subsequent tuning to get the ride right. Some issues to think about if you are doing this yourself are that the average wave board is not totally flat on the bottom, yet you want your foil plate to mount on a flat surface. So you either need to rebate the boxes a little or stand them proud a little. I chose the rebate method because it seemed neater and simpler. I routed out a 300 x150 hole almost full thickness of the board. Again not so simple, as the average router bit is not deep enough to do this in a single pass. Then epoxied in a layer of 6oz eglass, and 2 pieces of 150mm high density PU foam with a sandwich of 6oz glass between. The proud foam can be easily cut off with an oscillating multi tool. The foam then needs to be rebated in a few mm and the edges bevelled onto the surrounding glass. I found that a router set to 0.5 mm cut a good rebate all around the edges halfway through the surrounding glass layer. The foam is then glassed over with 2 layers of 6oz eglass and 2 layers of carbon which laps up and over the edges of the surrounding glass. This is then faired and the rebated area sanded till flat. Box holes are the routed out and the fin boxed glued in with epoxy/microfibre mix. 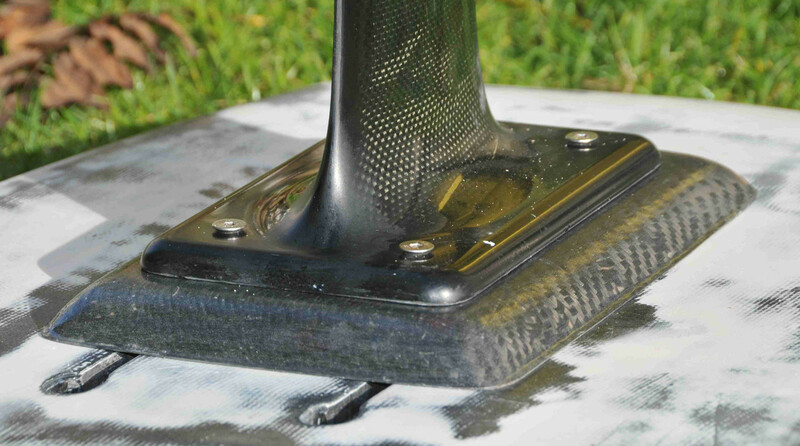 This is faired till flat and another layer of carbon and glass over that. Probably overkill on the glass/carbon but its bulletproof. The rest is cosmetic tidy-up. Marek had suggested that the rear screws of the foil should be 7 cm in front of the front screws of the back footstrap. I found this too far forward and have currently settled on 4 cm with a stance width of 60cm. I may open up the stance width a fraction forward yet. This has been a significant improvement over the stock board in terms of learning transitions because of stability during touch-downs. 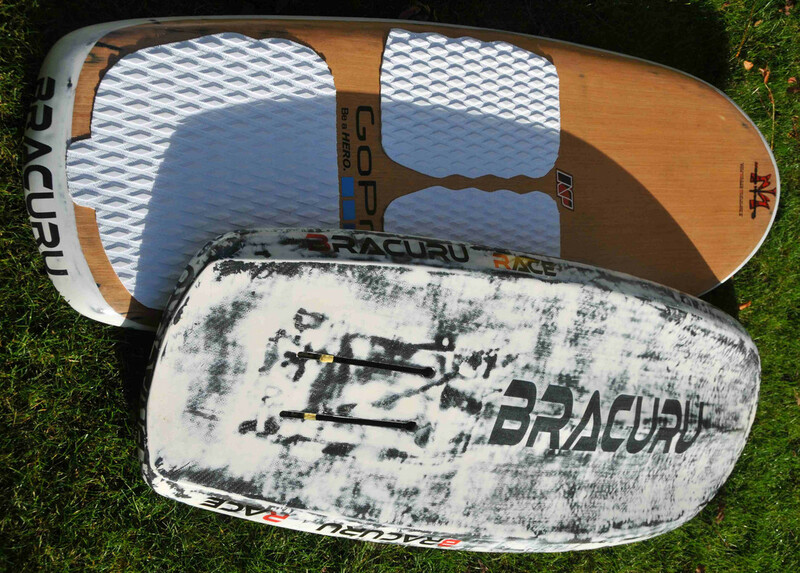 I think the stock board will still be cool for strapless. A couple of other tips: Once you have glassed over the finboxes the box slot can be very neatly opened up by using a small edge finishing router bit that follows the shape of the slot. I used 4 old stainless steel fin plates (I think we used to call them sliders???) I had kicking around from windsurfing days last century and tapped them out to M6 thread. Seems to be plenty strong enough. If you put a long piece of small diameter plastic tubing in the base of the fin box under the slider it holds the plates in position when the foil is detached so makes it easier to reposition next time and you don't run the risk of losing your sliders. When tuning you have the choice to move the footstraps or the foil. I have found that the position of the foil is best related to your back foot position. What I mean is that it is not exactly the same result moving the front straps forward as it is moving the foil back. You can end up with the back strap too far back wrt the foil and this gives you too much lever arm over the foil. Best to get the foil positioned so that the back foot control is comfortable without being too twitchy and then adjust the front straps to suit your stance width. Anyway hope this rant helps out someone. Foto update. This is a race model to test this winter. Last edited by BraCuru on Thu May 24, 2018 12:30 pm, edited 1 time in total. And the looks, cool ! Will you be doing a free ride version, possibly with a full deck pad? - love the wood ! TheRussian wrote: Will you be doing a free ride version, possibly with a full deck pad? - love the wood ! Interested to hear how the V-hull works out. I heard they tried that on course raceboards, but the "V" would catch waves and tend to make the nose turn to one side or the other. 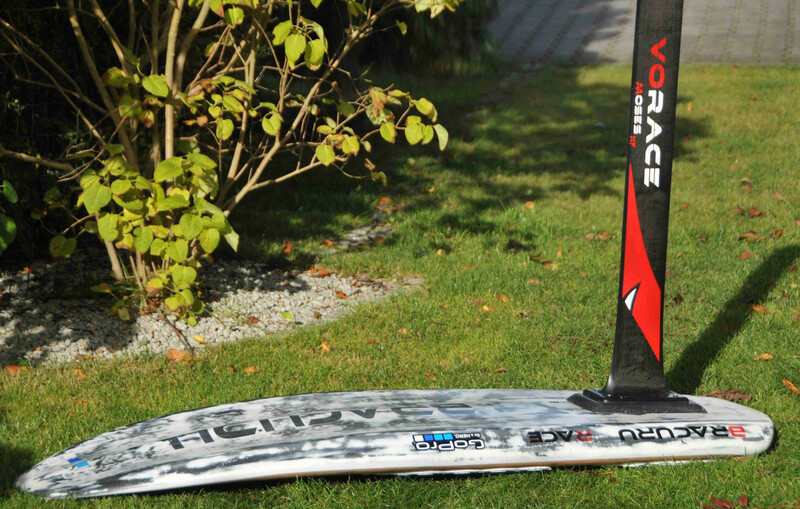 "Sub10" is a freeride/learning/light wind board. It might have a full pad on demand. Happy you like the wood. It is an oak. 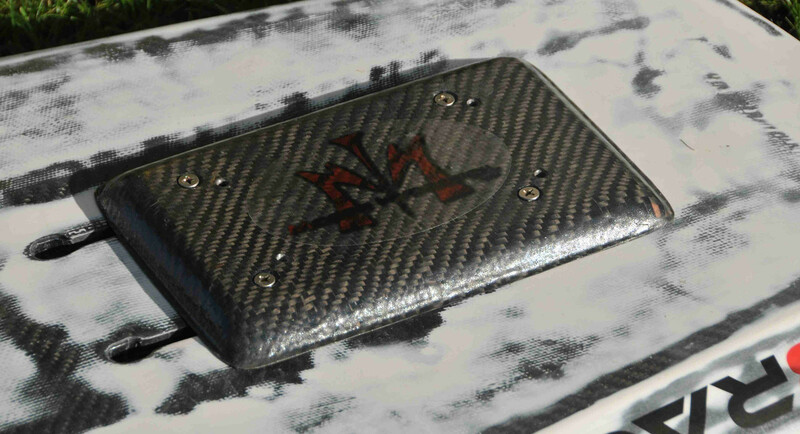 It is easier to apply then a bamboo but need to be tested on the water for longer while. "Race" - designed for the racers. However it might be used by anybody except beginners. The Sub10 is a better product for them. davesails7 wrote: Beautiful! Interested to hear how the V-hull works out. I heard they tried that on course raceboards, but the "V" would catch waves and tend to make the nose turn to one side or the other. We need to test it all available conditions. You are right - in the raceboards a double concave was an issue. In foilboards it is a different story. The double concave helps to the racer during a jibing when he enters the jibe being in air and then his board lands in the water. The contact should be as short as possible. Therefore the "Race's" nose is wider than Sub10. I am going to make 4 prototypes and test it thoroughly over the winter. I tried padless riding. The foil's feeling is a bit more direct. I think that is a reason Johnny rides his boards without pads. I like how you wrapped the wood on the deck rails. How did you laminate the wood down without getting ridges and gaps where the board curves? A bamboo got a linear structure. An oak not. An oak is easier to apply.